If you love collecting video or audio media from the Internet for your personal use, this is the app of your dreams. When on the Internet, we barely scratch the surface of all the media that is out there to feast on. Personally, I have become addicted to rare sound clips, bootleg sound clips, and occasionally I find obscure movies or television programs. In the last year, I have come across a wealth of material on YouTube. From rare songs that were on indie label albums that I lost long ago, isolated tracks from Queens’ vocals, Jimmy Page lead riffs to the full version of the theme from The Late Late Show with Craig Ferguson. To capture these gems it used to take a plethora of steps involving several pieces of software and you had to think through everything thoroughly to achieve results that were very good. Fortunately, some developer felt my pain. 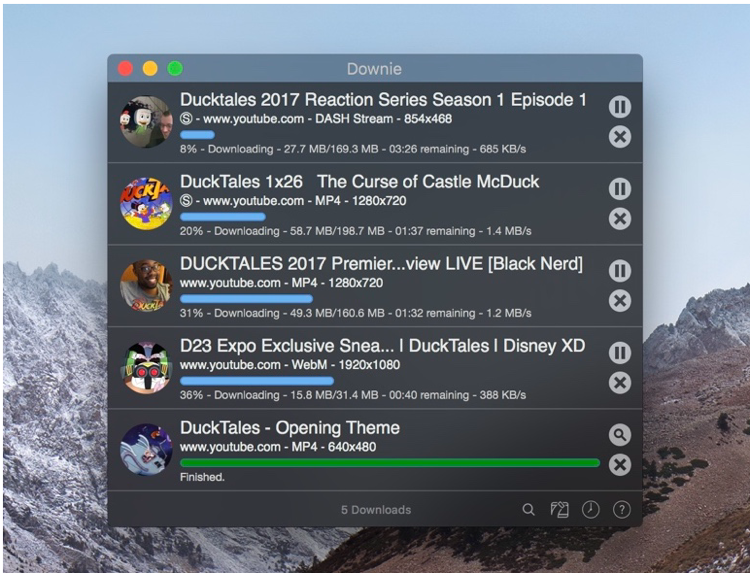 Downie lets you download from YouTube, Vimeo, Facebook, Instagram, and over 1,200 other websites. 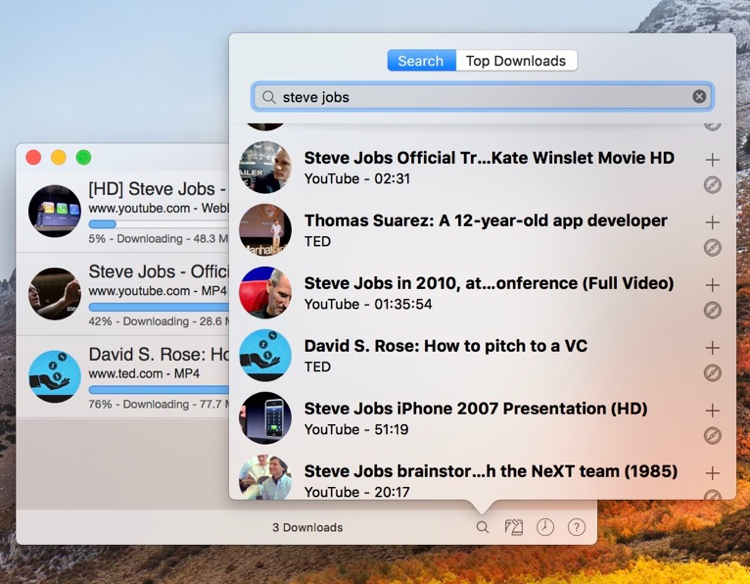 If there’s video content on a web page, you can trust Downie to save it onto your Mac. If you don’t need the entire video file, Downie can save only the audio track from that file. Or, if you want all your videos in the MP4 format, you can set Downie to convert them automatically. Using Downie is a breeze. Select a video to download. There are then several ways to proceed; you can drag and drop the link into the app, install the Downie browser extension for your browser of choice and click on that, you can drag the video onto the Downie icon in your dock, or use File\>Open URLs … from the Menu Bar. If you’d rather, you can type your search query into the app’s search field and it will promptly locate the video for you. Even if there’s text or other content on the page, Downie will detect the video and save it for you. You can download high-quality, high-definition videos from all across the web. Downie can even handle 4K resolution YouTube videos! And for those requiring Accessibility, it also downloads Closed Captioning. But suppose, as in my case, you don’t want the entire video but merely the audio? Downie can save only the audio track from the selected file. If you’d prefer all your videos in the MP4 format, you can set Downie to convert them automatically by going to Settings in the Menu Bar. There you can quickly choose None, Convert to MP4, Extract Audio Only, or Send to Permute for post-processing (more on that later). Downie is extensively customizable. Go to Preferences and the panel has anything that you would want to access. You can go through the usual General settings but you can choose your browser’s extension, set Parental Controls, and skim the multitude of websites that Downie works with. I’ve been using Downie for a couple of weeks now and with every use I find another valuable feature. And it’s usually an indispensable feature, it inevitably led to another one. It feels like I’ll be learning new features for months on end. But I love it! You can even set Downie to perform downloads while you sleep so you don’t clog up your bandwidth while working on other projects during the day. Files are downloaded in their own pane. When finished downloading, they were sent, at least in my case, to my Downloads folder. In fact, you can have the app send your downloads directly into your iTunes library. And as I said earlier, I’m sure I’ll stumble upon another feature that lets me customize that. Apparently Charlie Monroe isn’t sleeping nights. Downie is updated about once a week with new features, sites supported, etc. Extensive support on their website and through their Menu Bar. Post-processing is achieved with Permute, another of Charlie Monroe’s creations. Downie seamlessly integrates with Permute, a powerful media converter. To convert the video you’ve just downloaded to a different format or stitch parts of it into one file just send it to Permute and pick it up in that app. So, as an example, you can convert formats to enable you to achieve the ideal file size to fit as many video and audio downloads onto your iPad or iPhone as is possible. As addictive as this will become, remember one caveat. If not for your personal use, make sure that you have consent from the copyright holder before downloading copyrighted content. Downie can be found in your Setapp folder or purchased for USD $19.99 on Charlie Monroe Software’s website. And you can bundle Downie and Permute for USD $24.99 and save USD $5.00. Of course, there is a free trial, as well. So, give it a bash.